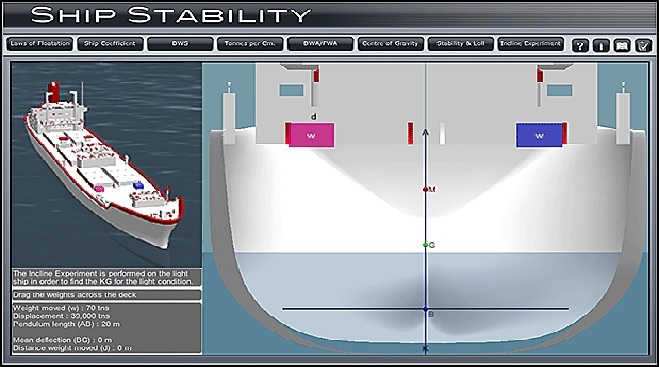 You can take ballast If you do so, (and if your vessel has ballast tanks that you can fill) then you should begin by pressing up tanks on the low side first This will initially make your angle of loll worse because you are adding weight on the side to which the vessel is leaning and you are introducing a free surface (if you are ballasting on an empty tank). This is still safer than ballasting the high side first, because that could cause the vessel to flop-over to the other side, and possibly capsize By introducing ballast you lower the centre of gravity If you are pressing up half-filled tanks, you are still lowering the CG and removing the free surface. The only negative effect of adding ballast is that it will increase your draft, reduce your freeboard and reserve buoyancy with the result that your vessel will ship water at a much smaller angle of heel. The second option open to you is to remove the cause. A loll does not suddenly occur. 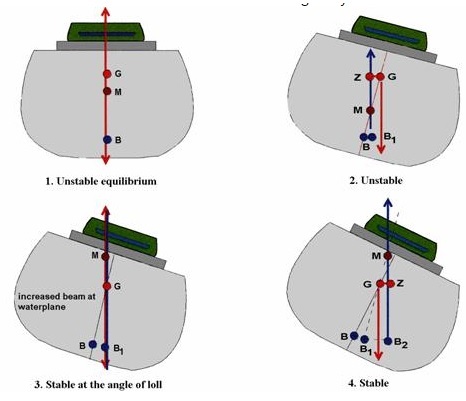 It is a result of decreasing stability which is caused by tile progressive raising of the centre of gravity of the vessel. This can only occur if you are loading weights on deck, and using fuel or water from low down in the hull (where most tanks are located anyway). You would have felt the vessel becoming progressively more tender and the roll period, and angle of roll steadily increasing. You may have been catching a load of fish – your brine tanks full and a large load of fish on deck. Too much weight high up. In these circumstances you may have to jettison cargo. This may be a painful decision, but the cargo is no use to you when your vessel is upside down. Check sounding off all the tanks. Ballast and press up slack DB tanks. Ballast low side first. Deballast slack tanks to empty. Deballast high tanks to shift G downwards. Shift ballast/fuel from high tank to lower tanks. Jettison cargoes from on deck if necessary and practicable. Calculate stability. Ensure vessel has sufficient GM. A ship is in an unstable condition if, when heeled by an external force in still water to a small angle, it continues to heel further when the external force is removed. 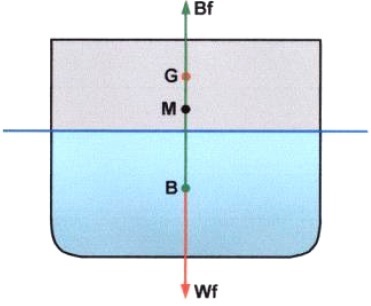 Consider a ship that is floating upright in still water with G and B as shown. The initial transverse metacentre (M) is below G.
The ship now heels to a small angle of inclination. 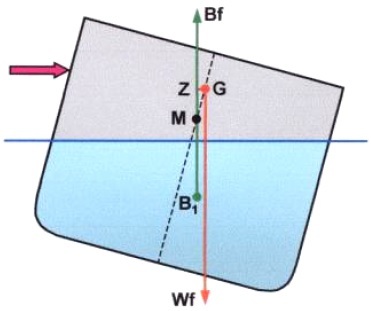 Consider the lines of action of Wf and Bf. They are acting in such a way to cause the ship to heel further over. GZ is a capsizing lever! What are the corrective actions for angle of loll and list?